Learn the Language of Real Estate Valuation. 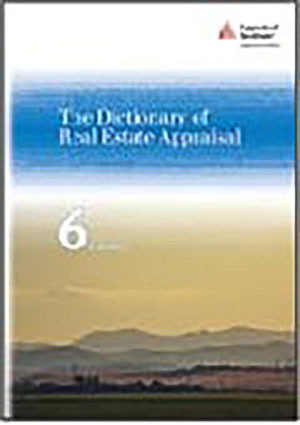 Dozens of dedicated valuation professionals debated and discussed the language of real estate to create the new edition of The Dictionary of Real Estate Appraisal. The highly anticipated, state-of-the-art references work includes: 1. Over 5,000 definintions and terms, 2. Seven freestanding glossaries pertaining to business valuation, statistics, architecture, construction, agriculture and the environment. With a new focus on the future of the profession, the dictionary will be an essential tool for years to come!